Claire and I wanted to get back into the Task 24 project and thought we'd start off with something relatively easy to get us re-motivated. Plus, who doesn't love fresh flowers in their space? After this task, I will definitely be having fresh flowers in my apartment regularly. Curiosity's office is right next to an enormous Mariano's. A small group of us go there practically every day for lunch. The ground floor has a coffee shop and an enormous floral department. If I'm ever feeling stressed, I like to pop in and grab a coffee and look at all of the flowers. 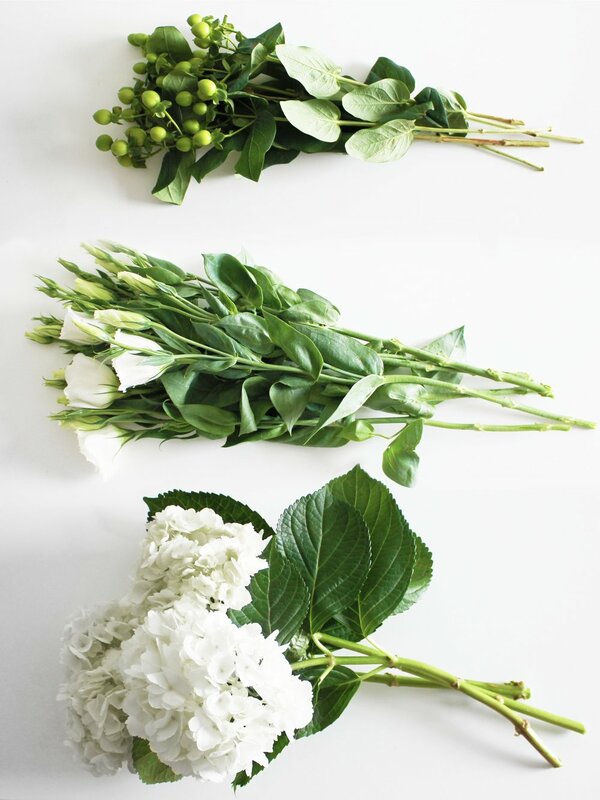 For this task, I found white hydrangeas (the big white flowers), white lisianthus (these look like bougie roses), and green hypericum coco (the lil' green berries) to go along with my new white bedding. I watched several YouTube videos on arranging flowers and read some words of advice from the queen, Martha Stewart. I learned that it's good to arrange odd numbers of flowers and to be sure to trim the ends of the stems before arranging. I truly thought I would get home with my flowers, pop them in a vase, and call it a day. Arranging flowers is hard AF. It's difficult to get a balance between the height of the flowers while still maintaining a uniform bouquet shape.I must have clipped the ends of the stems nearly 100 times to get the right shape. Is Eliza Doolittle making my lil' bouquets to sell on the streets of London in my apartment again?